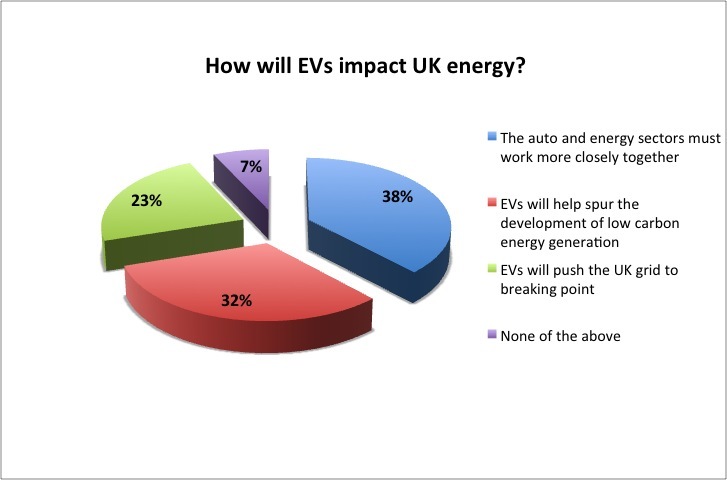 Last week, we asked our readers about the impact that increasing numbers of EVs will have on the UK grid. According to industry body SMMT, registrations of electric cars have risen dramatically over the past two years, from around 500 per month in 2014 to an average of 3000 per month by the end of last year. EVs are currently thought to represent around 1.5 per cent of the total new car market in the UK, a figure that’s expected to rise in the years ahead. Indeed, the National Grid predicts that up to 9.7 million EVs could be on UK roads by 2040. The most popular response (38%) in our poll was that the automotive and energy sectors needed to work more closely to address the issue. Almost a third of readers (32%) felt optimistic about the challenge of EVs, believing that the technology will encourage advances in low-carbon power generation. However, nearly a quarter (23%) of respondents were more sceptical, and think the expected flood of EVs will push the ageing UK grid to breaking point. We’ve already had some lively debate below the line, and the comments section will remain open for the discussion to continue. Let us know what you think of EVs, their pros and cons, and how you think they will impact the overall energy system in years to come. The network was was never designed for these newer low carbon loads and patterns are changing – daily, weekly, seasonally and LV networks are already experiencing problems. Yet rapid growth is predicted from EV charging, heatpumps and solar PV. In 2040 I call an autonomous Uber EV by mobile phone, whenever I need one to return me home from the theatre after a glass of wine . I might load my shopping into one to go home to hubby without me, so I can continue hiking. I’ll put a turbine into my gutter to create all the electricity I need. No need for grid. I take it you live in Manchester. If Manchurians lived longer I’m sure they would evolve with webbed feet and gills. I should know I was born there. and of course ( ) food, defence, sewage and water, transport, entertainment, data collection, administration, democracy, settlement of disputes, medical repairs…-you add your own? Is anyone surprised that the increasing use of EV is putting more strain on the generators. We talk about the grid being under pressure. Is it? or are we short of generation capacity. A very different thing. We can deliver it but there is not enough to deliver. One of the advantages of privatization of the energy industries was to allow the free market to determine the supply and demand for energy. Another was to allow the infrastructure companies to raise capital on the “market” based on business principles. Thus removing the long term indecision of governments. Not to mention cost to the tax payer. Seems to be working well. Candidate for a FMEA? Hasn’t someone already said that most of the charging would be off peak. The charging doesn’t have to start as soon as someone plugs in on there return from work of an evening. Positively not because I think the last thing they would want to do is charge at peak tariff, especially at the currents involve. Therefore the use of ELV’s charging could have a positive effect of evening out demand. Who’s to say that when you are not using the vehicle you could via the web give the authorities charging and discharging rights. The authority would then not need much in the way of strorage accumulators. EVs also havethe capacity to be used as storage devices. It is not good enough just to think of them in a separate context of road travel but also that if not being used could be used to power homes at times of peak demand, whilst storing at times of excess power generation. As part of a distributed energy grid, used in conjuction with smart energy they will help to shape the future of the UK energy system. The question that has not been answered yet, how much battery life do you sacrifice just to use it for random staorage? I suggest if possible hybrid or electric vehicle manufacturers to install solar panel under shatter proof transparent plastic sheath on vehicle top flush with the surface following the contour for charging battery. Perhaps the solution is simple as Mike Blamey puts it. Offer some local, low cost, generation and direct usage, say combined heat and power from gas. Naturally profits warnings from generators and grid would be the market forces resulting. leading to infrastructure investment. I like the idea, from Helen, of using the EV as a dis-connectable storage, balancing reserve. This could certainly help in triad situations. Clearly the grid infrastructure needs improving. But it is more the old technology such as voltage and frequency sensitive trips that presents most of the problem. A grid with better resilience can cope with the variable load presented by EV charging. In return, the EV’s with standardised charging systems can adjust their performance to suit in periods of difficult supply, without leaving themselves short of power for their main purpose. Equally, a grid with the ability to absorb loads better can also easier provide feed-in points for smaller scale power generation. The primary task is for the grid to have a better infrastructure but the auto industry should understand the effect of the load they present and help accommodate the necessary changes by working with the grid engineers. May be electric cars should only be charged in the off peak periods? Not ‘only’, perhaps ‘principally’ . Matching supply and demand becomes simpler with V2G. Lots of wind, it’s a choice between expensive constraint costs, or cheap vehicle charging. Certainly cheaper and easier than building pumped storage. It will be a feature of the smart grid and smart metering. There are already EVSEs that offer proportional charging based on local solar generation. Exactly this tech with smart metering controlled by the network is what would make this work. Pricing is how you influence consumer behaviour, but you must always maintain choice. If I’m driving to Orkney, even if I had a Tesla P100, I’d need at least one charge. I’m not stopping overnight! But you stop for eating, a pee, and to rest: surely re-charging your personal batteries! Why not the same for your car? Do I not recall that ‘coaching inns and post-houses/horses’ were to allow travellers to re-charge! Some-one once told me that the phrase Hobson’s Choice came from the post-horse proprietor who had the ‘franchise’ in Cambridge (Hobson!) who would not allow travellers to choose a horse, but had to take the one at the front of the ‘line’ -ie the longest rested! Is history repeating itself with charging of cars. Can we have some more data to work with? What modeling has been done to gauge the effect of the charging load, is most done at night for instance? If the situation got really tight would we need to buy generation capacity when we bought an electric car? Forget EV’s and costly batteries which take an age to charge up and discharge in no time. The future is Hydrogen FCEV, H2 can be produced using surplus wind/solar energy when the Govt gets its act together and puts serious investment in the refuelling infrastructure. Hyundai is working on a car with a 500 mile range which can be refueled in 3minutes. Although V2G offers those benefits at greater efficiency and lower cost. FC EV will have a place, but considering the average daily mileage in the UK is about 20 miles, it’s about 90% of people would only need that range occasionally. That would be a good rental market. Similarly for that group, EV charging would be every 2-3 days and only 50% capacity. Remember batteries are becoming much cheaper. FC EV buses and trucks offer best match for the tech, but would still charge from the grid overnight, as that would be more efficient…..
EV’s are pushing the development of battery technology, which if then used for renewables storage solves a multitude of issues. Look at the example of T’au which is now nearly 100% solar and Elon Musk’s offer to fix South Australia’s power problem in 100 days. Here’s how one transport engineer put it to me in a recent interview for another magazine. Just imagine all those electric cars coming home to their suburban street at night. The power supply to each house is designed to deliver a couple of kilowatts. Plug in a street’s worth of electric vehicles and watch all the lights go out. As he put it, the challenge “is a lot more difficult than people think”. For a start, who is going to pay the £15 billion or so it will take to replace the distribution network? All those electric vehicles won’t come home at the same time. With IoT technology there could be a data connection with the charger, that tells the vehicle when it is useful to charge. Immediately, at peak time, for triple the price. Later at night, when all TVs and washing machines are off – possibly free of charge. Here is the problem with many engineers – they can only see their own small field, and can’t possibly think across fields. Once, when Bill Gates was asked about the future of computers, he mentioned mini-computers, possibly mobile phones. You could use the mobile phone to call the mayor from your car to complain about the long red phase at your traffic light. But many years earlier we used loops in the road to measure how many cars are waiting at a traffic light, and how many more cars are coming. Then the traffic lights were switched according to demand. Don’t need much of a computer, just some counters and comparators. 3 cars north-south, 5 cars east west -> put a green to east west, and red to north south. On major thoroughfares show the speed that is necessary to get a green light at the next traffic light. No one, a relatively simple solution is possible. Time of Use tariffs for vehicle charging, eventually smart grid controlled to match generation intermittency. If it cost half as much, or less to charge after midnight, when would you charge? Electric vehicles will take many forms. There is the pedelec that gives me some push up the hill. The electric bus operated via overhead lines in the bus lane, and charged via induction coil at the terminal. The trucks and autonomous delivery vehicles between subway station and shops. The tram doing the delivery to factories as in Dresden. There will be private and public and organisational vehicles. One is for sure, the grid won’t get a constant demand, and with solar and PV there won’t be constant supply of energy. But there will be more information technology. Instant oversupply will switch on chargers and hydrogen generators. Instant overdemand will be covered by energy storage. We need to see the grid not just as just-in-time delivery, but more in terms of storage and distribution. And storage will also take many forms. Water reservoirs filled with pumps, battery storage, capacitors, heat storage, biogas, hydrogen, recycling. Recycling as storage medium will be interesting. Right now we collect recycling materials on heaps. With a sudden oversupply of energy a heap of recycling material could be shredded into another heap of pebbles. One form of storage transformed into another form of storage. The signal comes from the grid: now the price of energy is below 5p. For example. And there will be computers, and algorithms and databases. There are a lot of possibilities for engineers. The grid will be pushed to the brink of blackouts unless they radically change the way it is currently managed. EV drivers need an incentive to charge up when demand on the network is low ie nighttime and weekends, and allowed to sell power back to the grid when demand is high ie 4 pm to 7 pm winter weekdays. Currently there are absolutely no incentives. As an EV driver I follow human nature and like to keep my battery topped up which leads me to charge up when I get to work (coinciding with the morning peak demand on the grid) and charge up again when I get home in the evening (coinciding with the evening peak on the grid). This winter wholesale power prices have gone from -4p/kWh to +150 p/kWh. This volatility will only increase if we go ahead with more nuclear power stations. Minimum demand on the network last summer got as low as 16 000 MW. On a sunny windy day the country could be generating more than this with renewables and nuclear. Hence the increasing likelihood of negative wholesale prices. Just think, you could be paid for charging up your EV! You say there are no incentives, but what about Economy 7? On E7, “fuel” for a typical EV should cost about 1.2p per km. On day time tariff, about 2.8p. Here in Germany it costs 4.8 cents per km, and 3 cents per km if I can use solar power. The incentives work better in the UK. It doesn’t matter how well the automotive and energy sectors work together unless we have sufficient generation of power then it will fail, Government need to think about bringing on nuclear power stations for the future as environmental power station are too weather conscious. We need reliable energy source which we do not have at present. The first thing is to make sure that electric cars are mostly charged at off peak times, by giving access to lower cost tariffs. Perhaps easier said than done – recent research by SSE suggests EV users put their cars on charge when they come home from work, when demand is highest. Why don’t they charge over night when electricity is one third the price. With intelligent charging, EVs could help to flatten the daily and weekly demand curves – which will help investment in the UK grid. Obviously what we don’t want is 30 million cars all trying to take 7KW at 6pm. Thats easy, use the Smart Meter system to put up the prices as this particular load builds! The obvious answer to this point is to have intelligent chargers. Leaving it to owners is not going to work. Engineers and some scientists might take the trouble to choose charging times but most will just plug in when they arrive home. Not to do so risks forgetting and the car not being charged when needed. An improved and expanded EV public local and national transport system (road, rail, tram) should perhaps be considered, with additional tariffs for traditional private EV and CE based usage. How on earth do you think “EVs will help spur the development of low carbon energy generation” ? We have ~13GW Solar PV, ~15GW Wind, ~1.6 GW Hydro: total say 30GW. Average production last year was ~3GW, a tiny dent in our present demand….. then its proposed to triple the grid load with EVs; well good luck with that. What ever happened to basic maths? Don’t forget 9GW of nuclear running at about 90% in the winter, and being increased to 20GW over the next decade and a half. A friend of mine used to run a petrol car and his expenditure was appx $200/ week on petrol. Now, he runs an electric car. When he used to charge the car from the grid supply, his electricity bill went up about 50cents a day. Being an inventive chap, he bought a solar panel and now he charges the car on solar – cost of running the car per day = NIL. Savings are aproximately $10,000/year, which he puts into his retirement fund. Not surprisingly, I have just ordered my first electric car. He and his wife saved about $6,000 pa NOT owning a car. I am sure that generation will match demand esp. from renewable energy sources. The drivers for this are economic and political. However, the electrical distribution grid MV and LV will be put under a massive strain by widespread uptake of EVs. In some parts of the UK the LV infrastructure is already running near to capacity and any additional loads from EVs and other entities such as heat pumps will cause failures of the LV grid. No Dave, The drivers for this are nature & physics, if you want to do this with renewable energy sources you will only be able to drive after prolonged gales or bright sunny days & we’ll have to increase those sources ~30x present capacity. The alternative is Nuclear (Thorium) & then you could dump all the unreliable renewables. which is incredibly expensive and would drive up energy bills faster than adding large amount of renewables. As the tech improves and more cars get on the road I can’t see it making a big problem for the supply grid as surely most cars will be charged at night and if managed properly using like a night time tariff similar to economy 7 people will be encouraged to use with timers etc. As for the supply companies surely they will run more efficiently with the load spread across the 24hr period. The only fly in the ointment is that as soon as they can the government will start raising taxes on these cars or as in diesel say they are not as friendly as first thought? I agree, in actual fact, Coal = 8.7% & Gas (CCGT) = 45.9% The total is 54.6%. We run nuclear generators flat out because it’s reliable & we can plus they have a capacity factor ~90% whilst UK wind is unreliable has a capacity factor ~24%. (Which system would you prefer the operating theater connected to when you are on the table ?). Had it not been for coal then over the winter there would have been blackouts. Long periods of slack or no winds and overcast sky effectively took renewables down to almost zero levels of generation. Wind and PV are dilute and highly variable yet they are given privileged access to the grid when they can generate. High winds also take wind out of the equation. Carbon is not a notifiable disease. The true cost of power is when we don’t have it. Present “strategies” seem to be heading us straight for the cliff edge and to economic penury. Eventually, once battery technology has improved significantly, electric cars may be practical. None of the above comments mention the world shortage of many materials used in current batteries, nor the cost nor atmospheric pollution from their production. They do not mention the particulate pollution from brakes and tyres overburdened by the extra weight – energy regeneration from de-acceleration should be mandatory. The idea of using the batteries as household energy storage is not practical given the current restriction on battery charging cycles before replacement. Solar panels on the car roof would not generate a significant amount of power for most purposes; the garage roof might be more practical if only the car weren’t needing to be charged at night. Current electric cars do not have sufficient range for the company rep. or similar professional driver. Hydrogen cars might be a possibility if the hydrogen can be produced efficiently and providing that the nimbys can be legitimately persuaded to have a potential bomb in their garage or a bigger one at the filling station. So for the moment, the only practical eco-alternative is the hybrid, which also minimises any extra strain on the electricity grid. The future of Electric cars and the future of the National grid are two separate issues, even though they have some degree of overlap. Night-time charging of EVs could now be easily accommodated using off-peak capacity, even before we see the much needed revolution in grid capacity. Let’s start telling the truth about why EVs have been held back for so many years. The Chancellor collects about two thirds of the many billions of pounds spent on petrol and diesel fuels, so he isn’t going to allow this lucrative source of revenue to be taken away lightly. The oil companies, refiners and fuel distributors collect the remaining third, and they also dearly want to keep things that way. But sooner or later, just as computers replaced slide-rules, just as flat screens replaced CRTs, and just as mobile phones are replacing land lines, the electric car will inevitably replace cars powered by internal combustion engines. Political reasons, more than technological ones, are holding back the progress of EVs. Only allow future planning for houses aligned East / West with solar panels and a thicker copper wire infrastructure to take the output and use multiple local pump storage reservoirs. This gives energy security and makes use of simple existing reliable technology. Analysis of the winners and losers may lead to an interesting debate. Putting all your eggs into one basket like big power stations makes the infrastructure more vulnerable. Only allow companies within walking distance of residential estates. Then the majority of people can walk to work. interesting article from the conversation https://theconversation.com/how-electric-cars-can-help-save-the-grid-73914? If you look at the official project documents for T’au the installation also included 3 new 275kw Cummins diesel generator sets. The green press for some reason did not report this. Musk did not offer to fix South Australia’s power problems in 100 days. What he offered was to supply 100MWhrs of battery capacity in 100days or it would be free of charge. This is certainly not enough to solve the problems 300MWhrs or more will be required. Check the carbon intensity of electricity generation. The article also supports comments made earlier As well the need to synchronise EV sales with renewable energy growth, “conscious efforts must be made to synchronize battery recharging with the temporal peculiarities of renewable generation, which themselves will vary from region to region”. No one has mentioned the other fundamental problem with the Grid, its not just the load/capacity it is a matter of instability as well. No longer is the largest amount of capacity a spinning generator, which is easy to hold in sync. Wind power and photovoltaics are generating at DC and have to be inverter linked to achieve AC. Now synchronise all of that lot. With the advent of Autonomous Electric cars, all current Fossil Fuel cars could become obsolete as people change from owning cars to just using them as required. This would reduce the overall number of cars on the road network and demand for parking, interesting times for disruptive technology. Loose change, by comparison with the Bre(ak)it! bill £60 billion and counting?